¡Buenos días! Today’s book fits perfectly with both National Poetry Month and Earth Day. Martí’s Song for Freedom / Martí y sus versos por la libertad, written by Emma Otheguy, illustrated by Beatriz Vidal and translated by Adriana Domínguez, is a picture book biography of the Cuban hero José Martí (1853-1985). It was published in 2017 by Lee & Low Press. Each page provides the text in English and Spanish, with Otheguy interspersing Martí’s own words alongside her narration of his life. As a young boy, Jose Martí traveled to the countryside of Cuba and fell in love with the natural beauty of the land. During this trip he also witnessed the cruelties of slavery on sugar plantations. From that moment, Martí began to fight for the abolishment of slavery and for Cuban independence from Spain through his writing. By age seventeen, he was declared an enemy of Spain and was forced to leave his beloved island. Martí traveled the world and eventually settled in New York City. But the longer he stayed away from his homeland, the sicker and weaker he became. On doctor’s orders he traveled to the Catskill Mountains, where nature inspired him once again to fight for freedom. Here is a beautiful tribute to Jose Martí, written in verse with excerpts from his seminal work, Versos sencillos. He will always be remembered as a courageous fighter for freedom and peace among all men and women. Writing a children’s book is never easy. Writing a children’s book about a complex historical period and renowned figure is harder yet. Somehow, Otheguy does it. She manages to weave simple descriptions of Martí’s experiences into and alongside references to the broader history, politics, and cultural moments that shaped his philosophy. An epilogue at the end provides even more information about his life. This attention to detail is itself enough for the book to merit a prime bookshelf spot, but Otheguy does more than just situate him in history. Her carefully chosen verses also allow students to see the person behind the figure, and particularly his love of the natural world. With Earth Day upon us, it’s timely to read how she explores how the natural world influenced his philosophy. This attention to the natural world is particularly evident inOtheguy’s descriptions of Martí’s time in the United States. During Martí’s exile to New York, he soon came to realize that the American’s fixation withmoney created a sense of indifference and apathy which he could not tolerate. In order to escape the city and its materiality, Martí would go tothe Catskill Mountains, where he would walk and write. Otheguy describes the Catskill Mountains as Martí’s way of dwelling in Cuba fromafar – the pine trees of rural New York forests paralleling Cuba’s palm trees and beaches. A love of homeland becomes a literal love for the land, leading to the notion that it was his time in the New York countryside which recharged Martí and prompted him to return to Cuba to fight for his people. Vidal’s soft and colorful illustrations perfectly accompany the words of both Otheguy and Martí. Her depictions of the New York and Cuban countryside, of battlefields and urban spaces and of pain andcelebration are breathtaking and dynamic. As much as each individual image is striking, it is her choice of juxtaposition that lingers. Images of rolling hills are matched by horses charging into battle. “This book was inspired by my parents, who read me stories from La edad de oro and who embody every day the capacity to hold two homelands, two cultures, and two languages within oneself. When I was a child, they talked endlessly about their lives in Cuba, while staying ever-present in the very different lives my brother and sister and I shared. I hope this book captures my love for the palm trees of my parents’ homeland and the oak trees of nuestro Nueva York; I hope this book also conveys what it means to me that Martí, too, knew, loved, and was inspired by these two places.” Young readers who come from families and households that share multiple languages, places, and people may well relate to both Martí’s and Otheguy’s lives. Here you can hear Martí’s famous poem, Versos Sencillos, read aloud. Excerpts of this poem are found throughout Martí’s Song for Freedom/Martí y sus versos por la libertad. If you’d like to pair this title with other books on Cuba or other biographies, you might want to peruse Teaching for Change’s compiled Social Justice Books. I hope you enjoy this book as much as we do! In this particular book, Engle invites and inspires young readers with a collection of poems about 18 different Hispanics who lived between the years of 1713 and 2011. The people whom she highlights come from a variety of backgrounds, and they worked in many different fields. What they share in common is that they left an important impact on our world, and they are from the Americas. Before I dive further into the review, I want to have a short conversation about the term “Hispanic” and how it’s used in the book. This is one of many terms that have been chosen by or applied to peoples of Spanish and Latin American descent, alongside terms such as Chicano, Latino, Latinx, Mexicano, Mestizo and Spanish, among others. The use of these terms, including who gets to choose them and why they choose them, is part of a much larger history than we can offer here. Nonetheless we want to pause to acknowledge their complexity and offer at least a starting point for understanding the use of the term “Hispanic” in Bravo! She then goes on to highlight the achievements of both well-known and less famous Hispanics throughout time. Some of the impactful Hispanic people she highlights include: Juan de Miralles from Cuba, who helped America achieve independence from England; the fierce Juana Briones who was born in Spanish California and was a rancher, healer and midwife; Mexican-American botanist Ynés Mexía; Aída de Acosta from Cuba, who was the first female pilot; and Fabiola Cabeza de Baca, who was a New Mexican teacher, nutritionist and writer. After highlighting each historical figure, Engle writes a poem encompassing even more Hispanics who have had a large impact on our world today. It would be an endless job of fitting so many heroes into one book, and one can sense her struggle with wanting to include and celebrate as many people as she can. Alongside Engle’s writing, Rafael López’s illustrations are magnificent. With simple outlines and saturated colors, he captures the lively personalities that shine through Engle’s poetry, and uses carefully chosen background elements to tease out details of their lives. For example, in the illustration of botanist Ynés Mexía, she is surrounded by plants and flowers. Luis Agassiz Fuertes, painter of birds, is surrounded by birds and stands in front of a background of trees. Juana Briones, healer, rancher and herbalist, stands in a field amid herbs. readwritethink.org has some great lesson plan ideas and resources for using during National Poetry Month. The Poetry Foundation has a variety of resources, including poems for children in particular. Poems by Margarita Engle outside of those found in Bravo! are on this website. On her website, Margarita Engle has two videos with tips for teaching poetry to children. Given that Bravo! centers around individual stories and we are inviting you to use it as a tool for focusing on your students’ stories, it might be worthwhile to bring in an activity from Rethinking School’s book, Reading, Writing and Rising Up: Teaching About Social Justice and the Power of the Written Word, by Linda Christensen. While the whole book can be purchased as a PDF for $14.95, a sample lesson plan is available for free. It’s called “To Say the Name is to Begin the Story,” and it offers a community building lesson on the personal and cultural significance of naming. Check out the book link for the lesson plan and related resources. Finally, if you enjoy Engle’s work as much as we do, you might appreciate reading our reviews of her other books, including Drum Dream Girl and Silver People: Voices from the Panama Canal, in addition to our educator’s guides for The Surrender Tree / El árbol de la rendición (available in both Spanish and English), Hurricane Dancers: The First Caribbean Pirate Shipwreck, and The Lightning Dreamer. We also posted an interview with Margarita Engle that I recommend checking out. And we also recommend you head over to Latinx in Kid Lit for their complementary review of Bravo. We hope you enjoy this book as much as we did, and that it will be useful for you in the classroom during National Poetry Month and beyond! Our wonderful children’s book reviewer, Alice, is away from the blog this week. In place of her review, we thought we’d share this beautiful resource developed by Bookology Magazine: Poetry Mosaic. In honor of #NationalPoetryMonth, Bookology has invited authors to read their original poetry and is compiling the recordings into a mosaic of poets and poetry, with a new author highlighted each day. All of the poets selected are amazing, but here are a few of our Vamos a Leer favorites: Jorge Argueta, Pat Mora, and Margarita Engle. Argueta and Engle read both English and Spanish versions of their poems, so this is an even better start to the day for our bilingual readers. Take your pick of language! Hope you enjoy this poetic start to the day as much as we did! I am thrilled to be celebrating National Poetry Month with you! As with many of you, poetry holds a dear place in my heart. As a young person, I recall writing poem after poem and finding such liberation in exploring my voice, playing with syntax and line breaks, and testing out vocabulary that had yet to find a place in my daily life. Poetry allowed for a freedom and creativity that was unmatched in other mediums. And because of this, I believe that writing poetry enables us to develop our own voice, author our own truths, and honor our own experiences; all of which play an integral part in a young person’s social, emotional, and cognitive development. Saludos todos! This week we are kicking off April with a wonderful, spring-timey book. Our themes for April are the Earth and nature in celebration of Earth Day and also poetry in celebration of National Poetry Month. Although not all of my books for this month will be able to combine both of these themes so nicely, this week’s book indeed does. 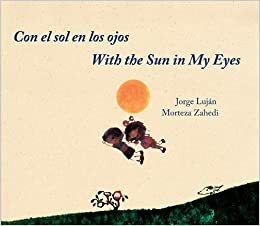 Con el sol en los ojos/ With the Sun in My Eyes, written by an Argentinian poet, Jorge Lujan, and illustrated by an Iranian artist, Morteza Zahedi, is a lovely story (written as a collection of poems) about a young boy and girl who discover the world and all of its natural beauty: “In this book of short poems, a young boy and girl find wonder, magic, beauty and humor in everything around them.” Although this book at first glance may seem sweet and simplistic, the poetry can be difficult to understand for younger children and the degree of artistic license and creativity used in this book might make it more interesting and enriching for older children (years 9-12). The book opens with a quote by Walt Whitman that can guide readers in their subsequent readings of the poems: “There was a child went forth every day,/ And the first object he look’d upon, that object he became.” This quote expresses the beautiful way in which children can become absorbed by their surroundings, and how the details of our environment, which sometimes allude us busy adults, are not lost on children and their wonderful creativity and imagination. se abren por fin los párpados del polen. Between water and light, air unfolds. and the pollen’s eyelids finally open. Here at Vamos a Leer we’re heartily embracing the sentiment of spring and poetry. In the coming weeks, we’ll share resources that highlight both, from children’s books that look at the natural world in a variety of ways to poetry for younger and older readers alike. We hope you enjoy our findings as much we’ve enjoyed discovering them.